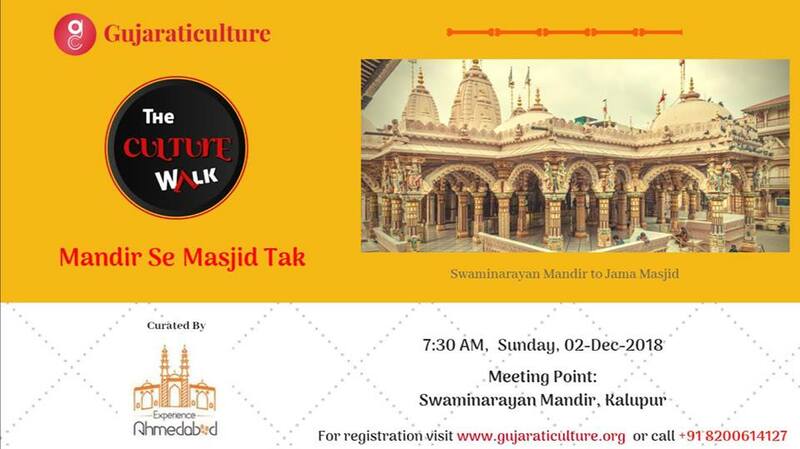 Shree Swaminarayan Mandir Road, Ahmedabad, India 380001. “The Culture Walk” : We Indian people are very rich in culture. Culture encompasses arts, languages, food, fashion, festivals, rituals, traditions, religion and history. Culture is our way of life. Culture is reflected in our heritage and in how we express ideas and creativity. Culture is a key part of wellness and learning. It can play a role in healing and social development. Our historic buildings, museums, monuments along with our natural heritage, are the legacy of our ancestors that are part of our identity and life we share. Our culture should be respected and preserved as it enables us to carve the path to our future in creative way. The Culture Walk is an initiative to spread awareness and knowledge about the culture. We will visit the places, arrange trips and get together as part of The Culture Walk.